Scott and Becky go East » Blog Archive » Camping in the rain … again! Camping in the rain … again! 87 km, 5 hrs, 30 min. Today didn’t start out as hot today as yesterday, but it was still pretty muggy. It threatened to rain a few times – a few drops trying to cool us down without much success. We started off by riding along the Prescott-Russell rail trail. At first the bugs were horrible. We had experienced a few spots yesterday where they were bad on the side roads, but the trail was much worse. You needed to be going more than 18 km/hr in order to be rid of them. I’m not sure what kind they were, possibly deer flies. However, once the trail left wooded areas and was surrounded by farm fields the flies were gone. I do wonder if this is related to the lack or forest or the amount of pesticides sprayed on the fields! We jumped off the trail just before Vankleek Hill. Of course, this meant we ended up climbing Vankleek Hill! We stopped for a delightful lunch at Mary’s Country Kitchen on main street. The chicken pot pie was excellent. 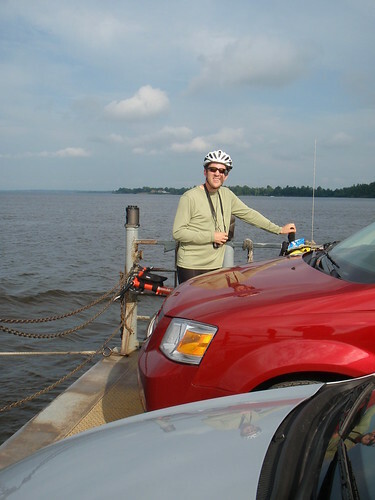 We made our way on familiar roads to Hudson, were we caught the ferry to Oka. 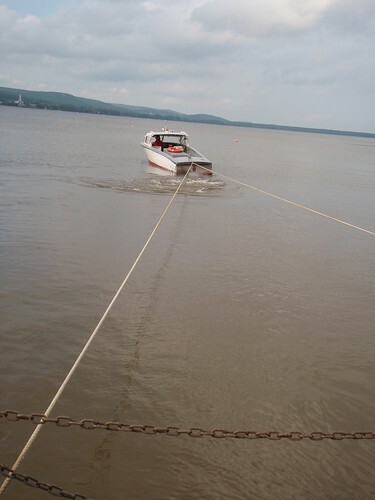 The Oka ferry was interesting. 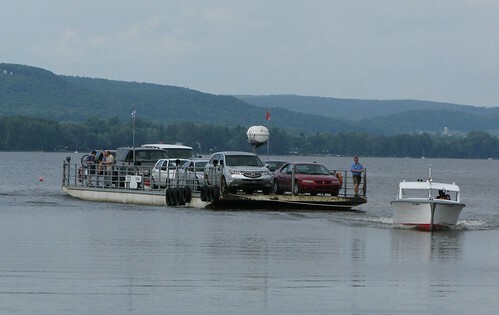 It was a barge towed by a power boat rather than a ferry. They broke all the rules I had learned regarding towing safety! Scott and I were stuck standing at the front of the barge right behind the tow lines. If anything were to go wrong, we would be in serious trouble. Apparently, the government has decided that this ferry no longer meets safety standards and they are in the process of upgrading it to a shiny new boat that is self-propelled. 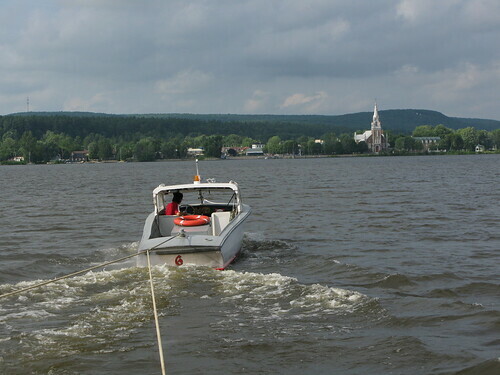 We saw the new boat, but it appears that the Oka side does not yet have a dock, so it isn’t in operation yet. We are staying the night at Oka Provincial Park. It is a beautiful park with nice wilderness camp grounds and a fairly long sand beach. The only negative is that the showers cost 25 cents. We decided to go for a swim rather than pay for showers! The water was nice and refreshing and warmer than Ron and Wendy’s pool! Just as I got back to the tent after brushing my teeth and getting ready for bed, the rain began. It is really quite amazing how we manage to be inside the tent just as the rain starts! It will be another wet tent morning. I think it has rained every single night we’ve stayed in the tent. So far we’ve managed to stay dry. 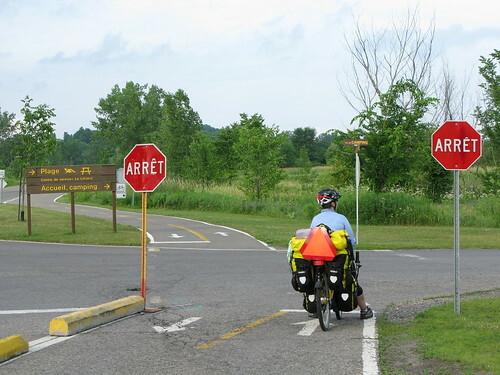 This entry was posted on Wednesday, July 9th, 2008 at 9:06 pm	and is filed under Canada, Journal, Quebec, Visited Places. You can follow any responses to this entry through the RSS 2.0 feed. You can leave a response, or trackback from your own site.